Written by a sonographer for sonographers, this text primarily discusses the role of echocardiography in the assessment of heart diseases. 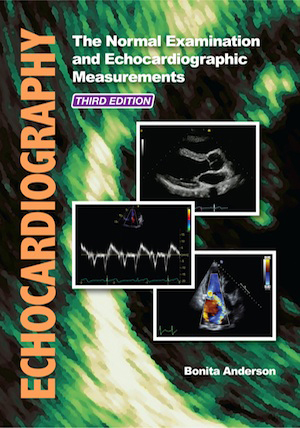 The book is mostly designed for students of echocardiography, teachers of echocardiography and cardiac sonographers working in routine clinical practice, but will also be very useful to echocardiologists and cardiac registrars. The goal of the text is to provide a comprehensive review of transthoracic echocardiography in the assessment of various cardiac pathologies. 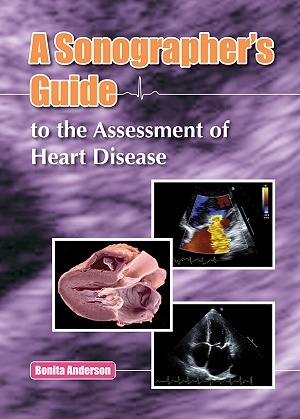 Refresher notes on cardiac anatomy and the relevant cardiac physiology and pathophysiology are included to expand the cardiac sonographer’s knowledge in this area and further their understanding of various diseases, disease processes and associated findings. This comprehensive text is supported by over 720 figures including over 1,200 echo images, over 130 pathological photos and many illustrations. It also includes several appendices, numerous tables and technical tips which highlight key concepts. Hard-cover bound with 507 printed pages, this text is ready to be adopted as any sonographer’s constant companion while dealing with the many challenges that arise in performing an echocardiographic examination. Real-time images that correspond to figures in the book are now available on this web-site (under the Publications menu). This allows readers to view the real-time image in association with the corresponding figure legends in the book. Click on the links below to open a new tab that displays real time images for that chapter. Please refer to the appropriate figure legends within the book for details. Published: Sonography (Australasian Sonographer’s Association Journal), Volume 1, Issue 1, September, 2014. Written by: Luke Cartwright, Canberra Hospital, ACT, Australia. Published: Journal of The British Society of Echocardiography (BSE), Issue 86, July, 2014. Written by: Julie Sandoval of Sheffield Teaching Hospital. Published: Doody’s Review Service (USA), MedInfoNow.com, April, 2014. Written by: Catherine Mylrea AMS, Echo Educator, MonashHeart, Victoria, Australia. Published: AJUM (Australasian Journal of Ultrasound in Medicine), February, 2014. Written by: Alison White BSc, MSc, DMU (Cardiac). Program Convenor of the Master of Clinical Science (Clinical Physiology), Griffith University and Board Member of the Diploma in Medical Ultrasonography (DMU), Australasian Society of Ultrasound in Medicine (ASUM). Published on: http://www.picsa.org.au, 17 February, 2014. Written by: Kim Prince B Hlth Sc, DMU (Cardiac), Masters Clin Physiology. Chief Cardiac Scientist Queensland Cardiology and Secretary of PICSA (Professionals in Cardiac Sciences Australia). Published on: http://intensivecarenetwork.com, 13 January, 2014. Written by: Sharon Kay PhD MSc (perfusion) GrDip (Echo) BSc(Hons), Cardiac Scientist, Lecturer in Echocardiography. As hard as we have tried to make this publication perfect in every way, there is always the possibility that some errors may have been missed before going to press. Also, new information can emerge that can make a change necessary. Unfortunately, once a book is printed and distributed, it is all but impossible to rectify this situation but with the World Wide Web, it is possible to bring any updates to the attention of those who care to stay in touch. Page 106: Alterations have been made to Table 4.16, in rows 2 and 5 as well as in the references. Click here to download a new version of this table. Page 110: Alterations have been made to Equation 4.29, Figure 4.38 text and Table 4.18. Click here to download a new corrected version of this page. Click here for a new version of the info box. Page 229: In Figure 8.24, the equation for deriving the P½t from the DT is mistranscribed. This should be P½t = 0.29 x DT. Therefore, P½t = 0.29 x 516 = 150 ms. Page 428-429: Some key points are missing from the Key Points table. Please Click here to download the extra key points for this table.